Drawing on unpublished letters and rare primary sources, King and Woolmans tell the true story behind the tragic romance and brutal assassination that sparked World War I In the summer of 1914, three great empires dominated Europe: Germany, Russia, and Austria-Hungary. Four years later all had vanished in the chaos of World War I. One event precipitated the conflict, and at its hear was a tragic love story. When Austrian heir Archduke Franz Ferdinand married for love against the wishes of the emperor, he and his wife Sophie were humiliated and shunned, yet they remained devoted to each other and to their children. The two bullets fired in Sarajevo not only ended their love story, but also led to war and a century of conflict. 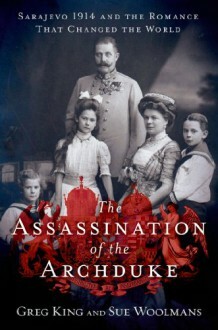 Set against a backdrop of glittering privilege, The Assassination of the Archduke combines royal history, touching romance, and political murder in a moving portrait of the end of an era. One hundred years after the event, it offers the startling truth behind the Sarajevo assassinations, including Serbian complicity and examines rumors of conspiracy and official negligence. Events in Sarajevo also doomed the couple’s children to lives of loss, exile, and the horrors of Nazi concentration camps, their plight echoing the horrors unleashed by their parents’ deaths. Challenging a century of myth, The Assassination of the Archduke resonates as a very human story of love destroyed by murder, revolution, and war.